Dr. Xiaomao Lin headed a U.S.-China Scientific Cooperation Exchange Program (SCEP) funded by USDA to visit China. The SCEP program is to support collaborative relationships between teams of scientific and technical experts from the United States and the People’s Republic of China. The program helps to promote U.S. agricultural priorities, encourage long-term cooperation in agricultural science and technology, create a positive atmosphere for agricultural trade, and enhance overall relations between the United States and China. Besides Dr. Lin, the KSU team included Kraig Roozeboom, Deann Presley, Robert Aiken, and Zach Zambreski, all in the Department of Agronomy. Figure 1. Melanie, Kraig Roozeboom, Robert Aiken, Xiaomao Lin, Deann Presley, Back row: Yuxin He* (Sichuan U. ), Zach Zambreski. 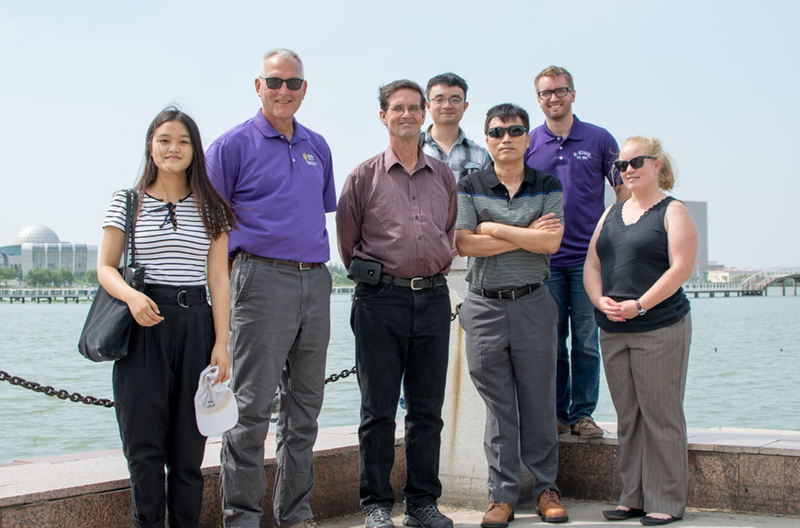 The theme of this SCEP project for the KSU team is “Adjusting Agricultural Practices in Response to Environmental Change – Climate Resilient Agriculture”. One goal was to exchange knowledge on the impacts of environmental changes on crop production and on practices and climate-informed tools under development to increase resiliency in corn, soybean, and wheat production systems. The other was to explore collaborative priorities and mechanisms for ongoing U.S.-China cooperation on challenges to production of these crops, particularly as presented by environmental changes. This would include development of ag-climate risk monitoring tools through integrating soil health, water and nutrient management, crop modeling, and climate information. 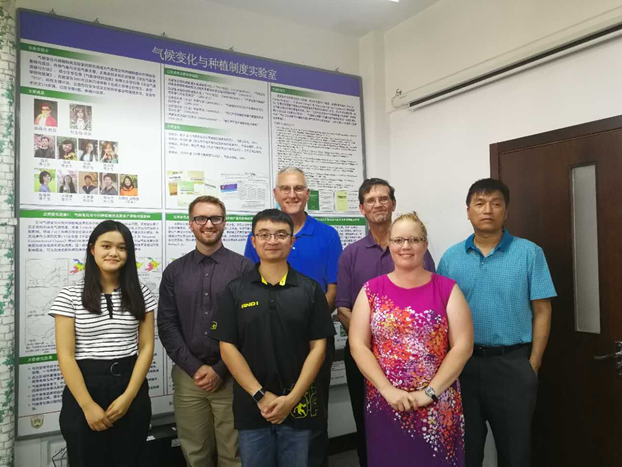 The team visited with the Faculty and Administrators of three Agricultural Universities and Scientists of the Chinese Academy of Agricultural Science. The presentation included an overview of major Innovation Labs hosted by the K-State College of Agriculture; recent evidence of climate change and impacts in the U.S. Great Plains; effects of water limitations on productivity of wheat and new approaches to identify varieties with enhanced water productivity; tillage impacts on soil erodibility and benefits of cover crops for soil protection, nutrient management, and improving cropping system resilience. Highlights of information gained from discussions and field trips include appreciation for the contribution of intensive management for high-yielding maize, soybean, and sorghum production managed by the National Farms in northeast China; the challenge of labor productivity in intensive small-holder cropping systems; opportunities to increase land productivity with relay and intercropping techniques in southwest China; recognition of the expansion of triple-cropping and double-cropping systems towards the north of China; and use of simulation techniques to quantify yield gaps and their interactions with climate change. Figure 2. KSU SCEP team in the graduate student labs at the China Agricultural University agricultural meteorology department. Future plans include recommendations to pursue memorandums of understanding with the Chinese universities in order to facilitate short-term student and faculty visits; undergraduate and graduate training programs; and joint research collaboration in drought monitoring and mitigation, yield gap analysis, intercropping opportunities and soil management. The KSU team is preparing audio-visual presentations for our departments and colleges, as well as printed material suitable for newsletters of our professional societies. Dr. Zheng of BYAU is among the scientists we visited who is planning to travel to the US for scientific meetings in January, 2018 as well as a possible visit at KSU. Additional information on the project can be found in the KSU 2017 SCEP Report Submission.